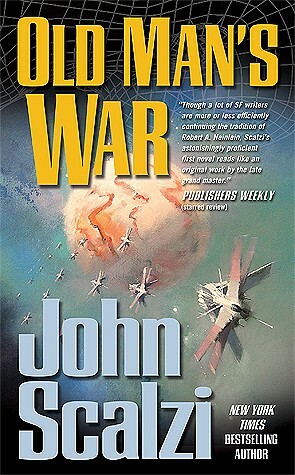 “Old Man’s War” is the first book in the “Old Man’s War” series, by John Scalzi. It tells the story of the protagonist, John Perry, a septuagenarian, who signs up to join the “Colonial Defense Force”, which is tasked with aggressively defending Earth and its colonies, against aliens. “Old Man’s War” is, at its core, a love story set up as military science fiction. John Scalzi has made this unlikely combination work brilliantly by adhering to a straightforward, linear plot. The action, of which there is plenty, is fast and heavy. This action is judiciously interspersed with slower sections, which helps build the story and drive the plot. This balance keeps the reader interested throughout and the book never palls. There is never a stage where technical gobbledygook or military wanking (*cough* Tom Clancy *cough*) gets to you. The world building is decent. It is typical space opera fare with a couple of twists. Earth has colonies; humans have to vie with aliens to establish these. The Colonial Defense Force is the space army. There are numerous colonies, even more technologies and innumerable alien races. The uniqueness comes with the objectives of the CDF and the technology it has. In fact, the CDF was reminiscent of the space marines in Robert Heinlein’s Starship Troopers . But to be fair, Starship Troopers is the template for military science fiction stories. On a aside, there are numerous call outs to Full Metal Jacket too. The other thing I found unique is a semi-spoiler which I have put below. “ I didn’t mind getting old when I was young either,” I said. “It’s the being old now that’s getting to me”. The characterization of John Perry is also great. We end up caring about him quite a lot. John Perry goes through a full cycle of discovery — he is literally reborn, fights for a cause, wonders what this is doing to him, makes peace with this and, at the end, has a form of closure. The other characters are mostly side show. This is a lost opportunity. There could have been better banter and team building given that this is military focused. This book was highly rated and recommended to me. I am happy to say that it does not disappoint. I could not put this down and I am eagerly looking forward to the next book in this series. I highly recommend “Old Man’s War” to science fiction fans.